**This CD won "Best 1st CD" award at the Le Cajun ceremony from the Cajun French Music Association in Lafayette Louisiana in August 2009**. http://www.cajunfrenchmusic.org/lecajun.html High energy traditional Cajun dance music you will Enjoy! Even though Charles Thibodeaux was born in Beaumont Texas, his Louisiana roots are strong and deep. His parents were from Church Point Louisiana and for their wedding dance Iry LeJeune provided the entertainment at their bal de maison. The family visited Church Point often when Charles was growing up spending much time there. After moving to Austin Texas, he became lonesome for the music of his roots and formed a Cajun Band in March of 2004. In their first years, they have played traditional Cajun Music throughout Texas including Fort Worth, Galveston, Victoria, Martinez, Beaumont, San Marcos, New Braunfels, Medina Lake, Cotulla, Lake Jackson, Houston, and San Antonio for the Cajun French Music Association (CFMA) events and also were featured at the International Accordion Festival in Houston and San Antonio Texas alongside Augie Meyers-----all while maintaining a busy schedule of shows in and around Austin. The Austin Cajun Aces represented Texas Cajuns at the Smithsonian International Festival in Washington DC in 2008. Wherever the Austin Cajun Aces go, you are sure to have a great time! 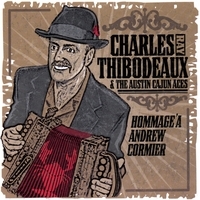 Hommage ‘a Andrew Cormier is the first recording of the Austin Cajun Aces. The CD serves as a tribute to pioneers of Cajun Music who left Louisiana in the 1950’s in hopes of finding better jobs along the Texas coast. Charles grew up watching Andrew Cormier, Dallas Roy and Rodney Lejeune play music at the legendary Rodair Club in Port Acres Texas which was owned by Charles’ late cousin, Joe Thibodeaux. The CD includes original Cajun Music with a taste of Zydeco and features a showcase of talented musicians. In the Two Step de Andrew Cormier , Charles wrote this song based on his memories of going to the Rodair Club on weekends during his earlier years. The Kaplan waltz features Dallas Roy as a special guest on vocals. On Diggy Diggy Lo, Je veux plus te voir, and La Pointe aux Pins, you really get the true sound of the strong roots of the Balfa Brothers Cajun Music style with the melodic fiddling and soulful vocals of Peter Schwarz (formerly of Steve Riley and the Mamou Playboys and having studied under master fiddler Dewey Balfa). The acoustic and driving electric guitar is played by Steve Doerr who also adds a special touch with his vocals on Café’ Chaud and Dog Hill. The talented Richard White, originally from Alexandria Louisiana, plays drums on several songs. My Wife And I Had not heard of Charles Thibodeaux Before. We Listened to some samples of his songs and liked what we heard. The CD was bettery than we touhgt. We would buy more of his CD's. Upbeat, energentic, high quality music with talented musicians...pleasing to the ears and the dancing feet!